I find myself yo-yo back and forth between the positive and the negative on the Tampa Bay Rays recent signings to bolster their roster coming into Spring Training. I mean the team picked up a 17-year pitching journeyman, a guy who falsified his identity, and a guy who I still consider a scumbag, but maybe he can become a viable power option and addition and slowly that title will be erased. I know I was one of those guys toying with Shelley Duncan way before his blatant attempt to shift ex-Rays 2B Akinori Iwamura cup towards the far right in a Spring game back in 2008, and since that time I have watched his name in multiple team’s stats pages never showing what I thought was his potential. I am also one of the guys who heckled him in RF when he was with the Yankees when his throws were less than stellar making sure to remark he threw like his girls’ name. But this is a different Rays team than the one who came off the bench and basically surrounded Duncan that faithful Spring afternoon with all of us remembering the “bear hug” Jonny Gomes applied to Duncan among other things. Sure it will take some time for me to forget all of that past experiences with Duncan at the center, but it can happen faster if he gets a few solid hits, drives in a few runs and make an attempt to be a member of this team. I am all about forgiveness if the potential and the fortitude both up skywards, and right now for me, Duncan better set his sights on the Stratosphere. Then we got the former reliever/closer Leo Nunez, or should I say the present day RP now officially known as Juan Carlos Oviedo who was one of those caught in the age and identity net back when he was a Bullpen fixture for the then Florida Marlins. Some might have thought it was “just desserts” that Nunez/Oviedo sustained an elbow injury during his minor league tune-up in 2012 after serving his 8-week MLB suspension for his part in the identity cover-up. Even though Oviedo might not have any real impact on the Rays 2013 Bullpen since he is still in the recovery phase from his Tommy John’s surgery, he could be a key piece of the Rays bullpen puzzle come 2014 when he would be 100% healthy, experienced as a closer, plus the Rays hold a 2014 club option on his services. 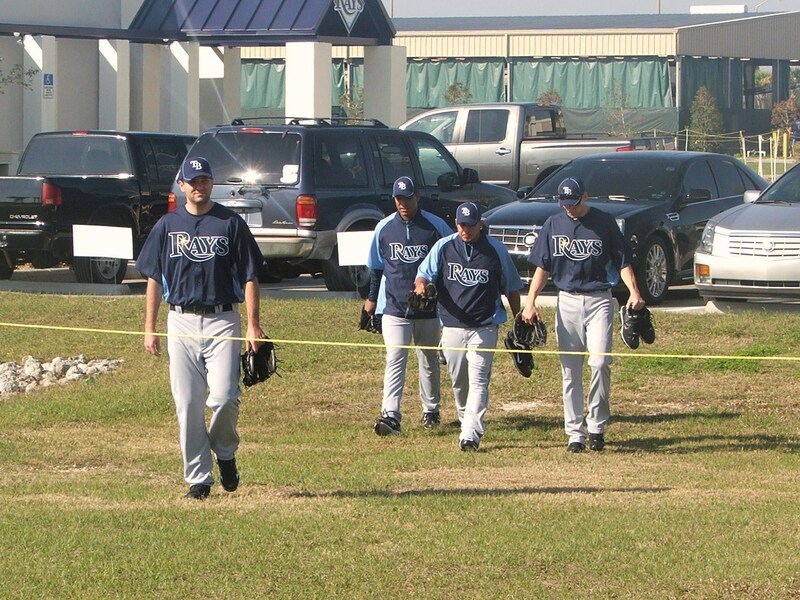 Ovideo might actually be one of those pieces that Rays can fit into their back pocket knowing he could be a bargaining chip come Winter 2013 for any member of the Rays Bullpen who wants to play hard ball for an extension or hefty raise. That brings me to the long-term MLB journeyman Jamey Wright who began his new relief profession back in 2008 and has averaged about 60 appearances a season since that first try at the Bullpen adventure. Last season with the Los Angeles Dodgers Wright held a 5-3 record with a respectable 3.72 ERA in 66 relief appearances with 6 holds. Off the top of my noggin, it seems Wright might be a nice veteran cog to use in situational appearances, but should not see many high leverage situations or possibly be a 6th or 7th inning stepping stone to the shut-down duo of RHP Joel Peralta and closer Fernando Rodney. But Wright would fit in perfectly with the multi-sport Rays who have been known to run football pass drills, play soccer in pre-game time and just be an all-around athletic team. Since Wright is of an advanced age, maybe he can play right fullback or midfield..or not. Then there was a fourth player brought in basically as question mark, but who showed potential in his prior minor league career that could pose a bit of a threat to someone on the Rays Bullpen bubble if he shows his stuff and makes a play for a 25-man slot. 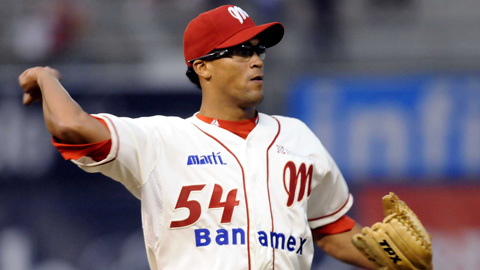 RP Juan Sandoval has been a frequent Triple-A guy in his past before his recent success in his tenures with Diablo Rojos de Mexico and Oaxaca in the in the Mexican League. Back in 2008 it seemed Sandoval might be a closer option since he posted 20 saves while in Huntsville in the Southern League (AA), but from there his star seemed to fizzle out a bit after a total of 9 innings at Triple-A Nashville that saw him take a journey back into the fold of the High-A Clearwater Threshers in 2010 before making his exodus to the Mexican League with Quintanna Roo, Diablos Rojos de Mexico in 2011 and foster a combined 6-14 record with those two club. But in 2012 while still in the Mexican North division he posted a respectable 7-3 record with the Diablos Rojo de Mexico and Oaxaca. It doesn’t take a genius to see Sandoval might be more of a Double or Triple-A player come April, but sometimes it just takes a chance again for a guy to rise to the occasion and with Brandon Gomes and Cesar Ramos the only Rays RP at this moment with a slight finger hold on a chance for a 25-man spot, a great Spring by Sandoval could make noise and possibly change the Rays focus to give the guy a chance to finally throw a pitch at the MLB level. Crazier things have happened…even in St. Petersburg. 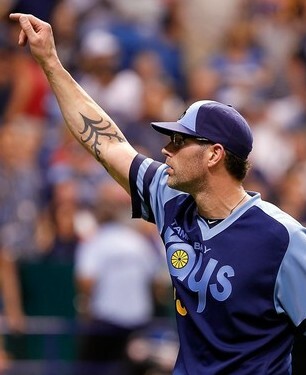 I mean the guy at least understands intimidating eyeear like Kyle Farnsworth. So the Rays decided to go the Good, the Bad, the Unknown and the Wounded angle with their recent signings. With the exception of Ovideo who is still recovering from his Tommy John’s surgery, the other 3 players who garnered a MLB camp Spring invite with their deals could see some significant time since Peralta and Rodney could miss some early time playing for the Dominican Republic squad in the World Baseball Classic. With Ben Zobrist also playing for Team USA in the WBC, Duncan could see his name either in a corner outfield slot or as a DH since at this moment the Rays have not signed a viable power option to fill one of their biggest offensive holes at this time. 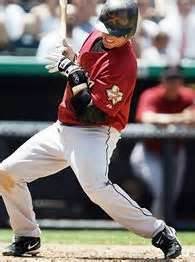 With time and with Duncan getting his bat on the ball this Spring, little bits of that 2008 episode will be erased and maybe if he brought his offense with him to the Rays this Spring I might even nod my head in approval of his name when it is announced. I mean the guy’s real first name is David, Shelley is his middle name. 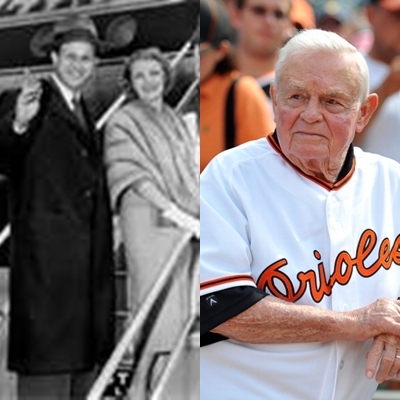 I am truly saddened by the passing of two Major League Baseball icons who had ties to the Tampa Bay and in particular, the St. Petersburg, Florida community. Both spent several Spring Trainings in this area, and both proudly wore their team’s bird upon their chest. I did have the pleasure of meeting both Stan Musial and Earl Weaver during the time the St. Louis Cardinals and Baltimore Orioles shared the St. Pete sunshine. I remember each for different reasons, but always cherished them as true baseball icons. 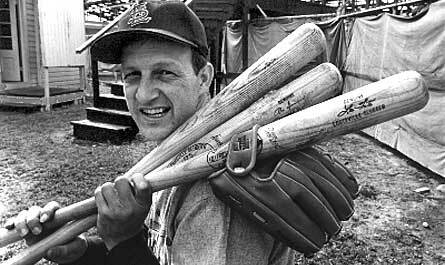 Musial was a frequent visitor to my father’s Pure Oil/Union 76 gas station during the 1970’s gas war days. I was the young kid who came out and pulled the cones for residents and ball players alike to come fill their tanks and get a windshield wash, tires and fluids checked and even bits of conversation about anything and everything under the bright Florida sky. Musial actually asked about getting a LOF (Lube, Oil and Filter) and was surprised to see a pint-sized junior mechanic under the grease rack doing the duties. He walked into the service bay and chatted with me about my love of baseball, offered to leave tickets for myself and my Dad, and even asked how my Little League season was unfolding. 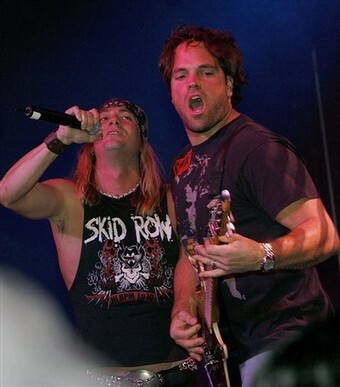 I found him to be a unique and soft-spoken man who got the privilege of playing baseball for a living for so long and made it to the top-tier of his profession. 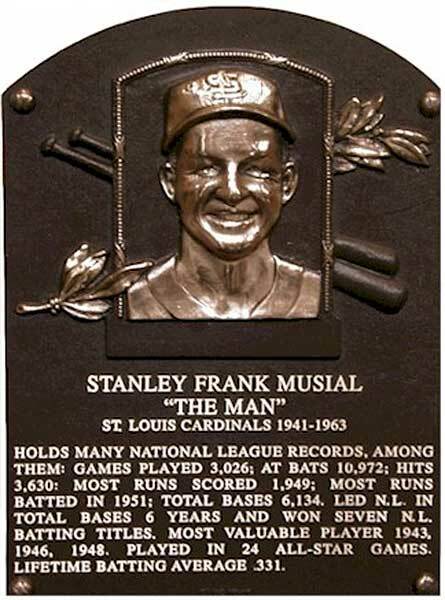 Musial came in a few more times that Spring, and we seemed to begin our conversations right where we left off, and I did go to a n umber of games where Musial tipped his cap to my Dad and myself and I even got to hold his bat once while he was signing autographs for other along the dugout fence. The worst part of all of this is that Musial was no longer a player at this time, and his time was spent sitting in the dugout, walking down the Al Lang Field fencing signing balls, photos and conversing with the fans before he made his way into the Clubhouse and disrobed and became one of us mingling near the Press box and wandering stadium with just a slight hint of invisibility. If I saw him under the stands I always came up to him, offered conversation and wanted him to know how much I respected him as a ballplayer and a man. St. Louis eventually decided to not come to St. Pete anymore for their Spring Training, and with it my special moments with Musial ceased. I have always wanted to hit the new and expansive Busch Stadium and hoped to catch a glimpse of the man I truly felt was not only “Mr Cardinal”, but one of my first baseball buddies. Before the Tampa Bay Rays were even a whisper on my lips, the Baltimore Orioles were my team of choice when it came to baseball. 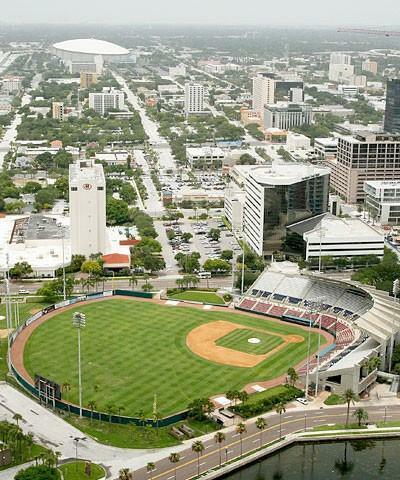 This was even before the Orioles decided to make St. Petersburg their Spring Training home for several seasons before they migrated elsewhere, never to return to this vista. I was a young ballplayer in the late 60’s, just beginning my on-field love of the game and enjoyed any moment I had down at the complex watching the likes of Boog Powell, John Lowenstein, Paul Blair and my favorite Brooks Robinson stride into the batters box or take their position on the field. 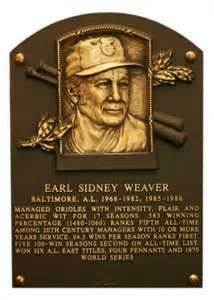 My introduction to O’s Manager Earl Weaver came bay accident, and in the most embarrassing situation. I was one of those kids who felt like an adult and wandered away from my parents a lot in my younger years. On this day I somehow got behind the security line of defense and wandered into the Orioles Clubhouse looking for the bathroom. If you have every seen the older style bathrooms of that era, there would be a massive trough or stalls lining one side of the room and what seemed like a mile of sinks and products lined along mirrors that seemed to go on forever. I was startled by the flushing sound behind me and even more startled when Weaver came out of the stall grumbling and throwing a few unknown words to the heavens. I think we both took a step back when we face each other, him in shock of seeing a young kid in his Clubhouse and myself seeing someone I respected and admired for his style of baseball. I extended my hand and introduced myself and Weaver just chuckled and called for the Clubhouse attendant. I was not sure if I was in trouble and should run, or take the penalty for my mis-guided adventure into an authorized area. Weaver instead asked the “clubbie” to get me an official Orioles cap and asked if I was having a great time. I shuddered a bit wondering why this legend wanted to know anything from me, but as we both walked out of the bathroom area the clubbie popped a cap on my head and we both walked out the green double doors towards the 4 fields on the North-side of the complex. My Dad saw me walk out with Weaver and you could see on his face I had done another of my many lifetime “Dennis the Menace” moments. I kind of shadowed Weaver a bit that day while I was at the ballpark complex, standing behind the fencing near him hearing his sage wisdom and advice to both players and fans alike. He was a grizzled baseball veteran, but also showed a heart of gold this day, even to a young fan like myself. I stayed at the complex until the players began to again head for the Clubhouse and leave for the day. 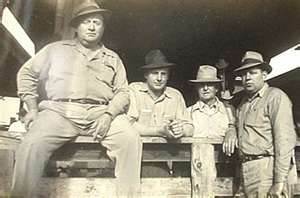 Weaver saw me tired and a bit sunburned from the day and tipped his cap as he also ventured into the coll air of the clubhouse for meetings and a bit of lunch. People talk about the harsh nature of Weaver, for his gruff commentary and demeanor, but on that given day, none of that came to the surface or showed its face to me or the assembled Spring crowd. Over that Spring I ventured down to the complex and to games as much as I could either in attendance of my parents, or by a lone bike trek to the St. Petersburg waterfront. Each time I scampered down to the fencing by the dugout with my O’s cap on my head hoping to get a pre-game cap nod from the O’s skipper. Both these men made huge impression on me at a young age about the game of baseball and I think each helped sow even more seeds that flowered into my undying love for this game. I had not seen or talked to either of these great baseball icons for many years, talking to both at charity events in the Tampa Bay area. It is always a somber event when you hear of one of your respected heroes and role models leaving this Earth. But I know if there is truly a place above the cloud where we ascend to, Weaver is growling with the Umpires and Stan the Man is young again and patrolling the outfield with passion and joy. 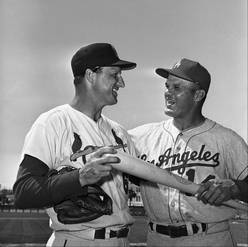 Musial and Weaver are in the Baseball Hall of Fame, but they also share a special place in my baseball heart…forever. 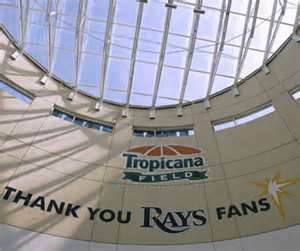 Hope Sweetbay’s Consolidation Doesn’t Sever Their Rays Partnership? 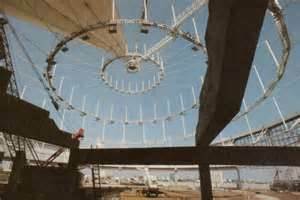 The minute I heard about the fact that Tampa Bay born Sweetbay Supermarkets were trimming their store chain by 33 locations within Tampa Bay I wondered immediately how the consolidation would affect their strong partnership with the Tampa Bay Rays? Sure the chain will still have over 72 store in Florida, but slicing the region of 33 locations definitely takes a huge chunk of both grocery sales and local “feel good” exposure for the grocery retailer. With the grocery chains long history of support and sponsorship with the Rays, you have to now wonder with 33 of their Tampa Bay stores being vacated just about the time for the Rays pitchers and catchers reporting to Spring Training if the close and intimate relationship the Rays and the grocery chain had for so many Major League Baseball seasons might also becoming to a haste conclusion. 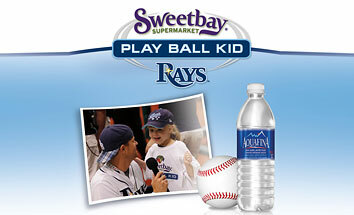 The chain became the first supermarket chain to join with the Rays back in September 2008 as the Rays were experiencing their “magical season of baseball”, when Sweetbay joined forces with the Rays by signing a multi-year partnership deal with the MLB franchise. From that moment on, the team and the grocery chain found interesting and unique ways to join bring the game of baseball into their stores. With Sweetbay’s consolidation announcement there is a boatload of questions without plausible answers at this time as to the continuation of such Rays game day experiences as the Rays Bat Kid of the game who loud and proudly announced that classic phrase “Play Ball!” before every Rays home game over the last few seasons. Sure the co-sponsor of the event, Aquafina/Pepsi could take the reins and make a smooth transition, but the fact remains, Sweetbay had a deeper impact on our Rays experience than we all realize. Could there be a naming change now for the former Sweetbay High-5 station manned by Rays players during the last 2 Rays Fan Fest where kids got to get a high-5 from Rays players and Coaches as they rounded Third and came into Home Plate. Most people might not remember, but Sweetbay was also one of the corporate sponsors of the Rays 2011 Fan Fest as well as hosting Rays players autograph signing within their stores. 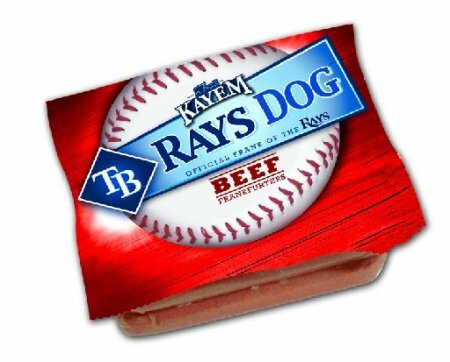 Sweetbay was also the first Tampa Bay area store to carry the same Kayem brand hot dogs sold during Rays home games at Tropicana field in their store locations throughout Tampa Bay to give fans a chance to also enjoy the same great hot dog taste while watching Rays away game broadcasts in the comfort of their own homes or backyards. 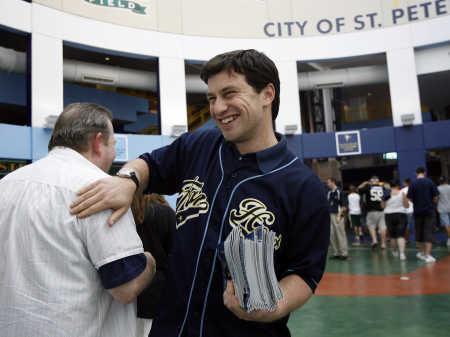 And who could forget their annual $1,000 shopping spree with a Rays player in one of their locations where a Rays fan gets to go wild getting grocery carts filled within an allotted time with the help of Raymond and one of the Rays players. Hopefully there is no huge effect of the relationship between the Rays and Sweetbay, but the reality is there will be less of a footprint in the region for the grocery chain and their long time partnership with the Rays could definitely be a victim in this change. 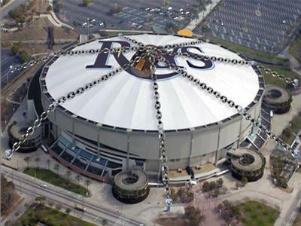 It would be sad to see the chain take a step back and re-assess or remove themselves from the Rays fold. It is a bit unsettling to see the chain who first brought their new name to our eyes in Largo, Florida in 2004, and is based in Tampa, Florida might be leaving our Rays game day experience. Together the Rays and Sweetbay chain made a great partnership with great game day and hit it out of the park regularly with their community events that not only sparked large crowds and a fond following, but showed that a sports franchise and a retailer could cross promote themselves with such class and grace. But I guess sometimes change happens whether we want it to or not. 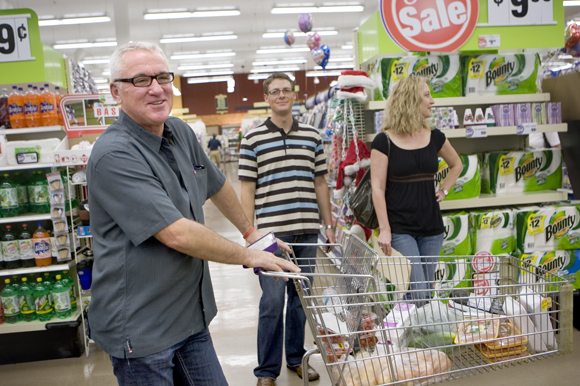 Heck, where will Rays Manager Joe Maddon shop for his annual Thanks-Mas event if the stores near the Trop are shuttered up? Could Farnsworth’s Late 2012 Slump be Costing Him a MLB Spot? 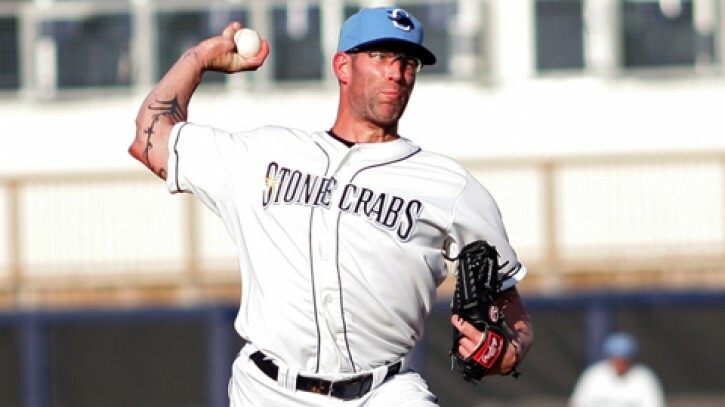 Right now Kyle Farnsworth is basically a “ghost” when it comes to the pending Major League Baseball Spring Training camp report dates. Normally I would find it truly unfathomable that Farnsworth would not have a contract, a moving destination or a possible membership pending in either Arizona of Florida to a local martial arts academy at this late stage in the MLB off-season. Could Farnsworth’s fall from pitching grace near the end of 2012 possibly put him in a question mark cubbyhole to be viewed as a secondary option and not a desired piece of any team’s Bullpen puzzle going into Spring Training. It is not like Farnsworth has an attitude problem, had any brawls or situation on or off the field since his well publicized “Paul Wilson or Jeremy Afeldt” differences of opinions. 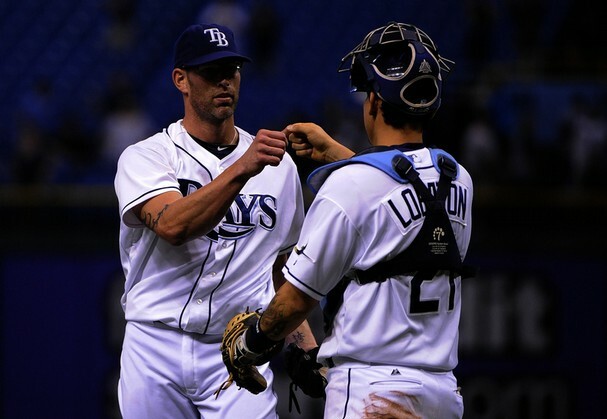 Heck, during his Rays tenure the guy was more timid down in the Bullpen with fans than intimidating and generally seemed to be well-liked and appreciated as a solid core of any Bullpen brigade. Farnsworth did have a bit of a rough patch coming out of Spring Training in 2012, being shut down for a time that helped pave the rebirth of Fernando Rodney to not only shoot a couple dozen arrows skyward but place a new bulls-eye with historic MLB seasonal achievements. It is not like Farnsy did anything personally during his Rays tenure to evoke anyone possibly seeing him as being “too intimidating” for their franchise, or troublesome in any degree. His Rays tenure has actually been kind of timid with a few untimely injury situations and a rough conclusion to the 2012 season. Maybe the main reason Farnsworth is not getting his usual bit of MLB love right now might be firmly attached to his late 2012 descending marks of an 0-3 record, a 10.13 ERA is his last 10 appearances after September 8th. You have to think the pure fact Farnsworth gave up his first relief HR of the season during this ” down” period is not the reason teams are not calling, but even though the 36-year old did hold opponents to a .216 average, his non-stellar 14 walks to 25 k’s ration is not “intimidating” at all. And this negative slide at the end of 2012 surely erased the fact that Farnsworth had a 13-inning scoreless streak (Aug 3-Sept 7) that preceded these odd late inning letdown by Farnsworth. Because of this late season slump, the positives of the early season like Farnsworth allowing only 3 hits and 2 walks in 10.1 innings in August but those stats get swiftly washed away by his allowing runs in 8 of his 34 appearances and losses in 6 of his last 8 games. Even today Rays Executive VP of Baseball Operations Andrew Friedman hinted to reporters that the Rays were in the market to sign another reliever, but there was not mention or hint of Farnsworth’s name attached to that tidbit from Friedman. You would think the Rays would be the odds-on favorite to get Farnsworth’s signature again on the dotted line, but with the Rays off-season multi-year contract to Joel Peralta, and the return of the archer himself (Rodney), maybe the Rays are looking for an inexpensive new weapon to add to their 1-2-3 late inning fireballer corps. There are some still hinting that Farnsy still has some of the best pure arm strength in the majors, coupled with an awesome 4-seamer fastball that can get pure gasoline even after his 13+ seasons in baseball. Combine that tasty high-octane morsel with his rejuvenated 85 mph slider and a 90 mph cutter and you got 3 distinctively different pitches that could make anyone look silly at the plate.Combine those nice tidbits of breaking pitches with his old 2-seamer and the occasional re-introduction of his splitter that can buckle the knees of some left-handed hitters, and you would think Farnsworth would be high on any of the 30 MLB teams “wish lists”. Maybe I’m missing something here, or blind to the fact I love to watch Farnsworth throw the ball in them glare at the hitters and Umpires respectfully. I guess this is the juncture in Farnsworth’s career where intimidation is trumped by the pure fact Farnsworth had a nasty late seasonal ride in 2012, and it might have cost him more than a pile of money. 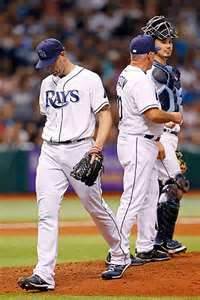 Let’s hope someone, possibly even the Rays take a chance and let Farnsy throw his heat high and tight in 2013. 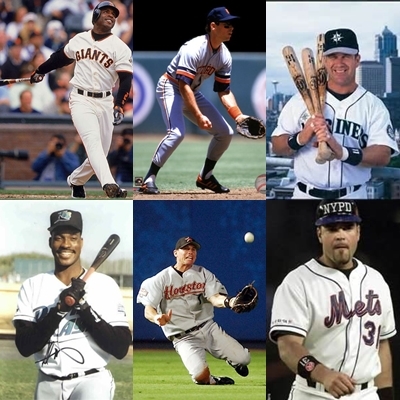 So, Who You Got on Your 2013 Hall of Fame Ballot? 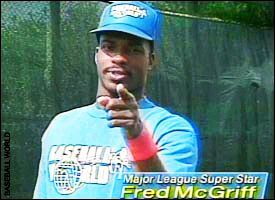 Surprise, disappointment,and astonishment should reign supreme today when the hierarchy that is Cooperstown announces their enshrined class for 2013, I am suspecting a few gasps, a few hip-hip hoo-rays, and hopefully a few “it’s about time” noises from coast-to-coast. Be it the players nominated who played the game “old school” style, or player who went to historic lengths to press their imprint on their bronze plaque, the Hall of Fame class of 2013 will definitely have their pros and (almost) cons…and the various and widening shower of 360 degrees of both positive and negative opinions will rain down quickly as the selection become public. It will be the first time we see via a voting tally what the fellowship of America’s favorite pastime truly feels about players who hustle, played the game within the chalk lines, and those who muddled them like a Southern rainstorm. Be you a pro-traditional sort, or one who yells to the rafters about the injustice of tainted stats possibly gaining iconic access into the hallowed halls, 2013 will definitely be the year of controversy and a first show of the river of divide that was the Steroid Era. I am truly expecting a few of the Hall of Fame voters to pronounce proudly they will not vote an accuser/abuser into the Hall even with monumental statistics that prove beyond a shadow of a doubt that they were/are in the game higher echelon all-time. 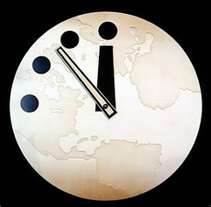 Dark clouds will definitely be in order on this day no matter the sky cover or the temps as heat will rise and more than a few opinions will rant and rave up a storm, possibly into whirlwind potential. Even the recent acknowledgment of Mark McGuire of his ruse might not be enough to float him towards those hallowed chambers, and his long time farce might actually cost him another chance in 2014 if the voters decide he doesn’t even desire the lowest total possible for another single chance at admittance. There are a few names not tarnished by the era of the needle who should hear the phone ring today be it a catcher who offensively changed his position, or a ornery cuss who reminded fans and the media of those long ago icons who blistered out over 3,000 Rawlings which should get him a front row seat on the podium in his first Hall of Fame chance. I’m hoping a shortstop who played in old Tigers Stadium who for years was overshadow by Cal Ripken Jr, but who played that old constant style of clean and concise defense his calling card while Ripken made his with the lumber. There are so many different style of players,disciplines and even motivations who could get a chance today to hear their names echoed from sea-to-shining sea and with it the quick opinions running rampant on whose team caps they will adorn along with their smile on their bronze plaque. 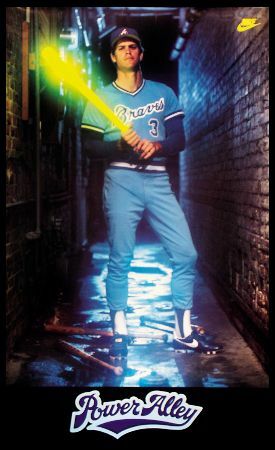 I want to think it is pure skullduggery and thievery if the “Crime Dog” is again robbed of a chance for election, but then I remember some think the skinny First Baseman who rocked 200 Home Runs in each side of the MLB didn’t hit that stellar 500 HR plateau and again will have to buy a ticket to enter the Hall. I expect a few names to bring a large amount of aggressive shock and awe that they are not only excluded once again, but possibly being a step closer to that critical vote percentage tipping point where their names may disappear from the ballot forever. Be he a “sure thing”, a player lost in the controversial shuffle, or one of those arraigned, tried and found not guilty in the court of law, but not in the public court of opinion. If you gaze up at the opening photo montage on this post you will see the 6 names I would have selected on my personal 2013 Baseball Hall of Fame ballot. I struggled with expanding it to 8 names, but I’m sure the 2 people I juggled on and off the list will get the needed votes to be eligible again for the Hall of Fame eligibility in 2014, then I would check their names with no reservations. 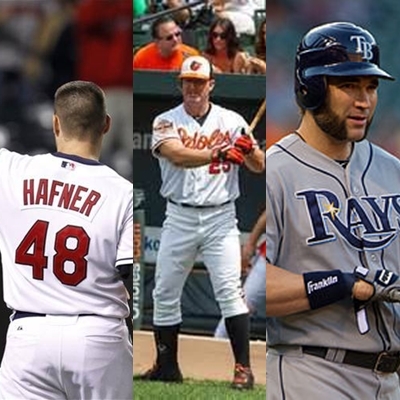 Even with the disagreements, opinions and gambit of emotions from anger to excited, this is definitely going to be a Hall of Fame class we will be talking about the entire 2013 Major League baseball season…….So, who you got on your 2013 Hall of Fame ballot? To most people the above crypt ed type is a by-gone era relic of communication mostly done between long distance communicators or ships at sea. But to me it seems like a fitting code to use when the Tampa Bay Rays might be seeking out another body, and one who could take on multiple player duties while being a member of the Rays roster. Maybe it is more than fitting that I tried to throw out a makeshift code of “We Want Mike Morse” in the above telegraph possibly showing at least one member of the Rays Republic’s adamant desire that the Rays go out ad get this desired First Base/DH and most of all, right handed hitting option. 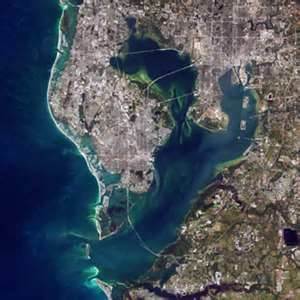 Possibly it is an omen today that temps in the Tampa Bay region are hitting the Spring and Summer averages showing maybe even a higher power wanting this deal to go to fruition. 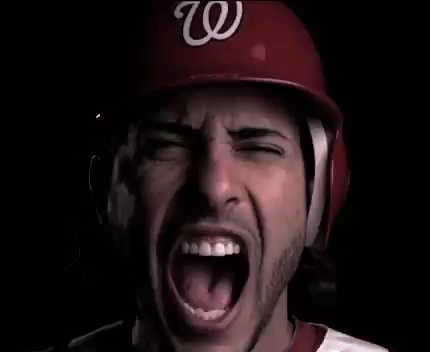 But the total reality today is that the Washington Nationals since they signed their desired 1B Adam LaRoche to the dotted line, Morse might be a few dashes or dots away from finding a new vista to call home, and since Morse code is associated with water…..possibly ending up on a team who’s own hometown is surrounded on 3- sides by water. Some might ponder the idea that since Morse is in his “walk” season before he hits free agency for the first time a trade for him might not be in the Rays best interest, but if you dig beyond the surface and truly see the stats for what they are…Morse could be just the right fit for Rays Manager Joe Maddon’s sometimes maddening system of plug-and-go lineup shifting roles and reversing logic to find wins, key hits and much needed runs. Morse’s 3-season line of .296/.345/.516 might not just out on the page at you, but it is clearly a huge upgrade to the 2012 Carlos Pena debacle and combined with already in-house option James Loney, the “Maddoning” lineup possibilities and positioning is simply boggling with right and left handed options possibly being inter-changed at First and DH with the addition of Morse. If you really think about it, if the Rays did trade for Morse who is set to make $ 6.75 million this season, you get twice the bag (and less K’s) for the slightly over $ 250,000 the money the Rays paid Pena in 2012 to mostly tap his cap on Home Runs and be the returning smiling face. It might surprise you that Morse had over 5 years of MLB service time split with 2 seasons each with the Seattle Mariners and Nats, but making Morse and even bigger prize for the Rays is another small bit of flexibility that Maddon enjoys even more. 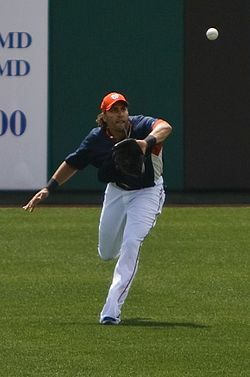 Morse can also play other spots in the infield besides 1st (SS, 3B) as well as possibly a corner outfield position. With Desmond Jennings making a slight shift left in 2013 to post up at B J Upton’s old haunt, Centerfield, Morse could play right into Maddon’s always mind-bending game of match-up and situational defense possibly finally securing Ben Zobrist for mostly infield and outfield duties from time to time. Instantly some of the cautious Rays Republic followers will bring up the pure fact in 2012 Morse only hit out 18 Rawlings while in 2011 he hit a career high 31 orbs into the cheap seats. 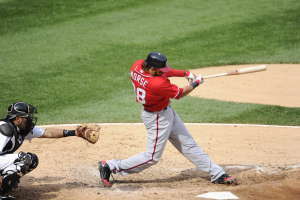 But even as you would notice Morse had a dip in his offensive numbers in 2012, he was also playing throughout the season with more than 1 nagging injury and still put together a season that showed his commitment to the game, confidence in his abilities and provided a added power option for the Nats. That in a nut shell is the type of guy the Rays need. He fits the Maddon profile of being able to post up at various positions, plus has been in the post season race, plus played in a highly competitive NL East division that yearly produces enough stress and pressure to crumble a tea kettle. The dashes and dots all point to Morse as being the kind of player who will transcend under Maddon. But you have to ask if the Rays have the personnel to pull off such a heist. Why yes they do! 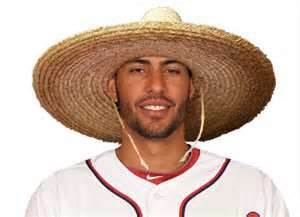 Considering the Nats lost out on former Rays RP J P Howell, maybe Friedman could patchwork up a nice package with a centerpiece of Southpaws Cesar Ramos or Alex Torres as viable Bullpen options. Torres has limited relief appearances, but his 2012 chances showed he might have a better calling in the MLB as a relief option than as a starter. Ramos we already know has the goods to be a consistent reliever and would be a valuable piece of the Rays Bullpen puzzle to lose, but if it bring a hint of better offensive presence….I’d jump on it and ride it until it dies. Combine either of these leftie options, or possibly send a piece like OF Brandon Guyer or maybe even someone in the minors who is a few years away from MLB ready and if you are Washington you get a need filled, a extra bit of outfield security and a player developing in the wings to fill a future need, possibly in the infield. Now this is not to convey the Rays will even take a gander at Morse with more than the usual Friedman cell call to ponder, wonder and suggest ad lib, but with camps beginning to open in just over 35 days, things concerning Morse might just hit a fast and furious pace as five other MLB squads also seek their own “Morse code” answer for 2013. I am expecting to hear a lot of dots and dashes over the next few days with hopefully Friedman finding the right combo and most conducive package to net the Rays Morse’s talents for 2013. 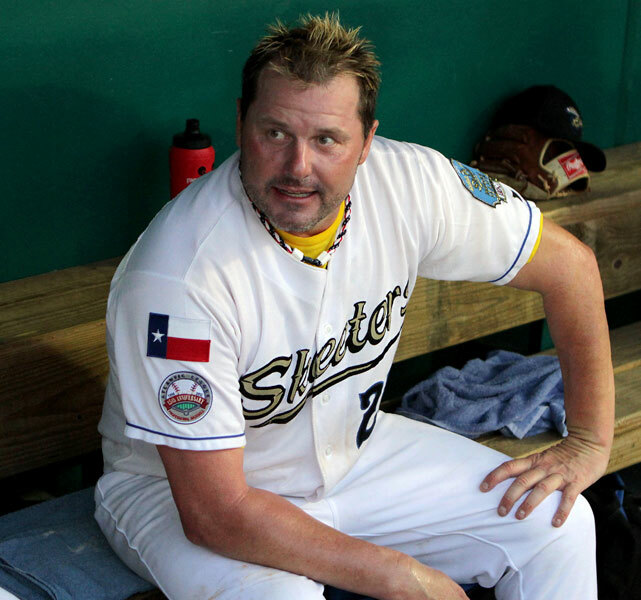 Maybe the Tampa Bay Rays waited a tad bit too long this time in looking for their 2013 Designated Hitter. Looking on various websites at potential “fits”, I found 7 names that seem to be listed on each of these sites as basically only “DH” candidates, and 3 of those names are former Rays players. I’m not even talking here about guys who might be right-handed and could pose a secondary First Base option and switch off as a DH or late inning power producer, for this post I’m hitting just the viable Free Agent DH candidates. As I mentioned before, 3 former Rays made the list on 3 different Free Agent DH websites lists. 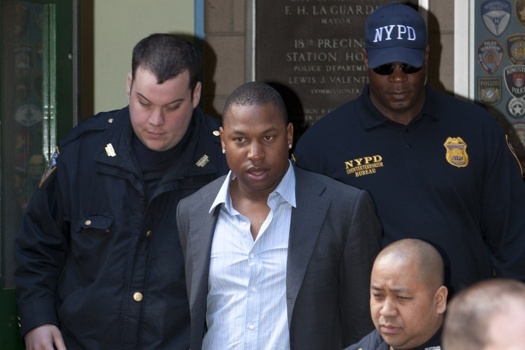 One of the listed Delmon Young can be automatically eliminated from this discussion because of his past temperament issues. Adding some more spice onto this is the fact I do not think Rays Manager Joe Maddon has Young on his annual Christmas Card list. Sure he still has youth and a crafty bat, but his attitude and demeanor probably will prevent any serious Rays discussion unless someone want to pull a prank on Maddon or Friedman. Then you get a second name that might merit a return, but at what cost. 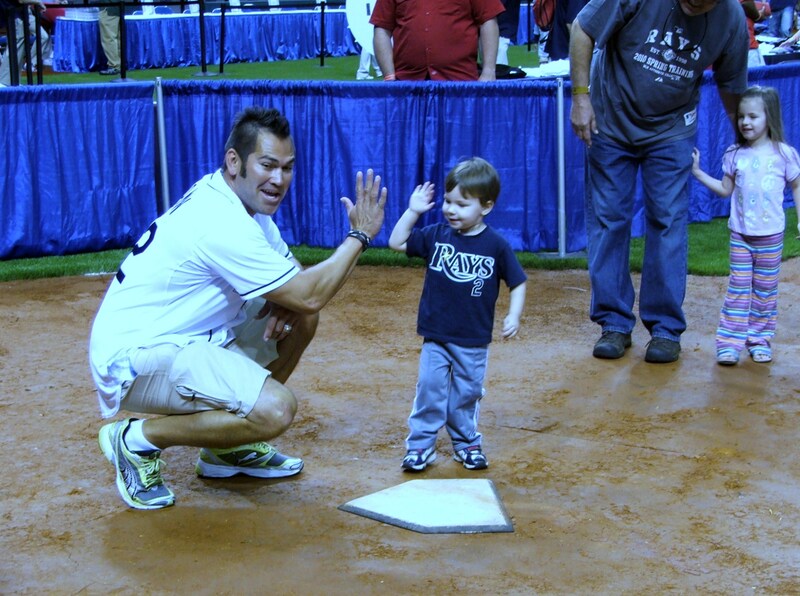 Johnny Damon did a lot in the Rays Clubhouse building upon the team’s strong leadership foundation, brought his hustle and bustle nightly, even if it was at a reduced speed due to his age. I loved his want to produce “big plays” and scoring opportunities with every swat of the bat, but he has digressed into a slap hitter, mostly producing RBI opportunities for others than being that DH who can drive the runs in and bring home the victory by himself. For that and possibly $5 or 6 million other reasons, Damon would be a role player at best for the Rays in 2013. The one guy who I think might merit a second chance is the “Wolverine”. 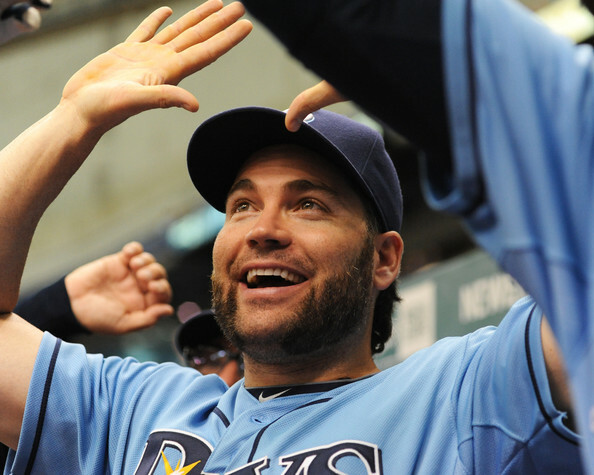 Sure Luke Scott had that dreadful hit-less streak that might stand for a decade, but the guy when he is focused, healthy and combined with the energy of this team seems to not only produce, but finds ways to motivate and get this team in the right mood to win games. But this Rays squad doesn’t need another cheerleader or bench attitude booster, it needs a guy who is healthy, hits the plate knowing his hit can score runs, and provide protection for the Rays middle of the lineup hitters by provoking a little stress when his name is announced. Scott might deserve a second try, but he would have to come in at the right cost and be willing to produce from day 1. There are other names out there that at least pique my interest like Jim Thome or maybe even Travis (Pronk) Hafner, but my honest gut tells me these guys have another great year left in them, but my head is telling me it might not be 2013. That leaves 2 names, Nick Johnson and one time D-Ray (for a NY minute) Bobby Abreu. Just like Thome above, Johnson has had enough injury time in his career to warrant any deal to be heavily laced with performance and appearance incentives rather than a solid seasonal paycheck. Abreu in my opinion last played an honest season of baseball as an Angel and that was some time ago. So out of the stable of guys who might only be “DH” options for the Rays, only their 2012 edition Scott might make sense for the team again in 2013. That doesn’t mean Thome or Hafner are lesser players, but their potential for injury might be greater than their bang for the buck. Still, I think of the 7 names prevalently listed on a few of these websites lists for DH possibilities, Scott, Thome and Hafner might be the cream of the crop, but it is not a bumper crop and might be one more devastated with question marks than answers. Whatever happens, the player selected has to bring power, stability and a core value of producing runs and getting those additional wins that might be needed in a more competitive American League East race in 2013. Each and every one of these DH selections besides Young (27 yrs old) are above 34 years of age, and each have injury concerns as well as if their power will be there for another seasons of swinging the bat. As Spring Report Date draws nearer, it is looking more and more like the Rays might find their 2013 DH on another teams roster. 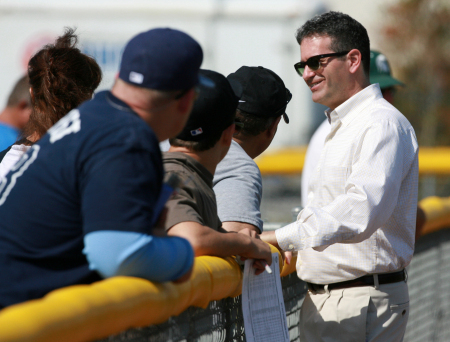 I do not envy Rays Executive VP of Baseball Ops Andrew Friedman in finding some luster in this crop, or possibly even picking one of my three as potential fixtures for the Rays roster. Post Script: Sorry it has been a short while since a post but I underwent an off-season surgery myself recently and have only felt like popping the keyboard today. All is well and I will have glove in hand again, possibly by the Rays Pitchers and Catcher Report date. What a great and grand New Years day present to hear the Tampa Bay Rays and their ace, David Price have come to an agreement for his 2013 salary. Sure a 1-year, $10.1 million dollar payday for the upcoming 2013 season is nothing to sneeze at (or if you are Astro..snort at), but the reality is so many of us had hoped the recent decision of Evan Longoria to basically announce he wants to be a “Ray for Life” might rub off a bit on his condo-sharing neighbor Price. Realistically you had hoped the Rays would have pushed harder for at least a 2-year deal to hedge their own “fiscal cliff” and keeping Price at least in a Rays jersey until late July 2014. But the blatant fact here is Price knows his stock will soar yearly as he meanders towards his Free Agency years, that if he stays consistent and produces number that are in the higher echelon of the MLB hurlers, the dollar signs and length of contract will increase tremendously. That by itself would surely dictate a 1-year deal for 2013. 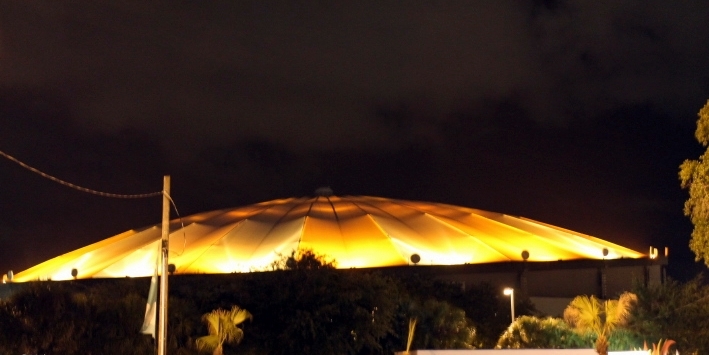 I think I’m not the only one hoping somewhere within the Rays 4th floor there is someone trying to not only persuade Price and his agent to think long-term, but that the new Rays pitching leadership figure might want to stay with the thoughts of teaming along side Longo for at least the next 5 seasons possibly pushing the Rays past their present post season darkness. You want to think someone who has not only embraced the region, but its fan base with such smiles and up-lifting comments would make a visual or fiscal move to show confidence in the system and the Rays composition. 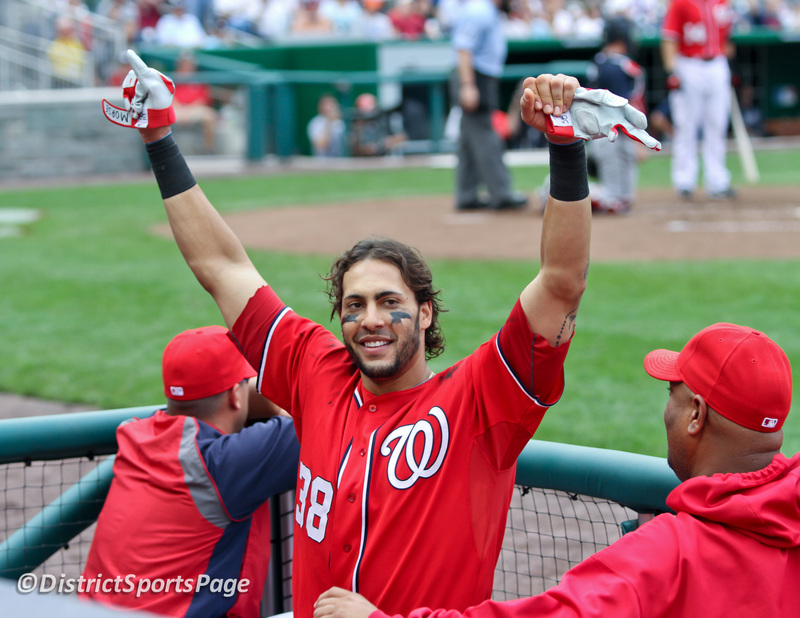 Maybe I’m a bit naive in thinking Price would make a gesture towards this community showing his want and eagerness to stay beyond his proposed 2015 payday. Possibly my sugarplum and sunshine daydreams are all well and good, but Price’s own agent has basically let it slip out Price want to be the best, and that might not only pertain to the playing field. If that rhetoric stands, new Dodger SP Zack Grienke and his MLB record 6-year, $147 million dollar acquisition might be pushed to the #2 slot when Price hit the Free Agent market. Price himself has let out little sound feelings that suggest he wants to be the best, and by the way he has produced on the field and stayed clean off it during his career, teams would be crazy not to line up and try to get him signed on the dotted line. So maybe I’m throwing some rain water on the pure sunshine that Price is signed, sealed and delivered for 2013, but behind all that glitter that is Price’s new gold is the common fact this might be the first step towards the final parting of Price and the Rays. I want to be just like so many other and be naive to the fact Price will command a possible $13-14 million dollar payday as he goes through salary arbitration again next Winter. This kind of financial burden would not cripple so many other ball clubs, but with the Rays coffers not lined in silver and gold, anything over his present $10.1 million salary could stagnant the Rays chance at improvement at other positions, especially the devoid Designated Hitter slot. With just a 1-season contract at this moment, could Price realistically be entering the twilight of his Rays adventure? Could this type of thinking snowball and take on such momentum this season that by the Trade Deadline, Price’s name goes from a whisper to a deafening shout as a trade piece? You want to thrust such thoughts deep down into your gut and not make them even public, but the truth is unless there is some form of futuristic commitment over the next 7 months as to his financial and physical standing with this team, He could be gone. Price has been a great Ray since his relief efforts during their World Series run back in 2008, and his star has risen to such heights even over the past 2 seasons that the Rays may not be able to hitch their wagon to him anymore as Price might have finally entered that red zone of outgrowing the Rays fiscal comfort area. Price is that one pitcher who come but once a generation for a team struggling with their payroll like the Rays. He has produced above and beyond expectations, shown his All-Star savvy and even garnered a few pieces of lifetime hardware for his efforts. He has made his dog Astro one of the best known MLB canine groupies ever and have even brought him to cult status in Tampa Bay and around the MLB. Price has had his bumps and bruises along the way, but has shown with class and confidence his style both on and off the hill are of the top order. Some might say his $10.1 million salary was at the high-end of what the Rays would want to pay for Price, but the figure is in line with estimates and media speculations. You want to be optimistic at a moment like this and applaud and commend Price for a job well done during his career and embrace his achievements as we become anxiously awaiting his 2013 return to the playing fields of Port Charlotte, Florida for Spring Training. Maybe by then we will have heard more out of the Price camp about the future, the present situation and his own opinions on him possibly being a “Ray” long-term. But as always, there is some darkness under this ultimate floating cloud’s silver lining, especially in the hopes of tying Price to a long-term deal or extension. Some would say I’m trying to pry open the Rays Carolina Blue curtain and further exposing the approaching danger on the horizon, but maybe it is more I’m finally coming to the conclusion Price might not be the type of player who wants to be a “lifetime” Ray. Hopefully he will prove me wrong….sooner rather than later.